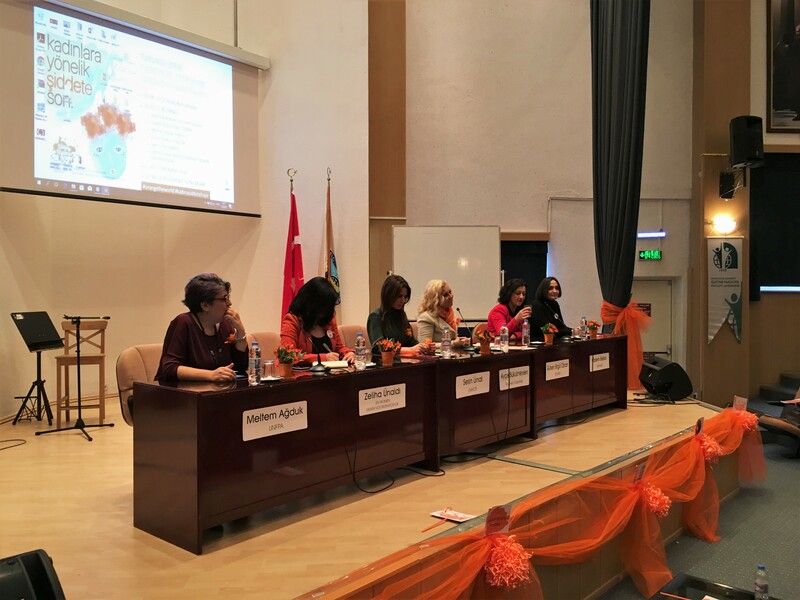 UNFPA Turkey | Orange Summit in Izmir! Home News Orange Summit in Izmir! 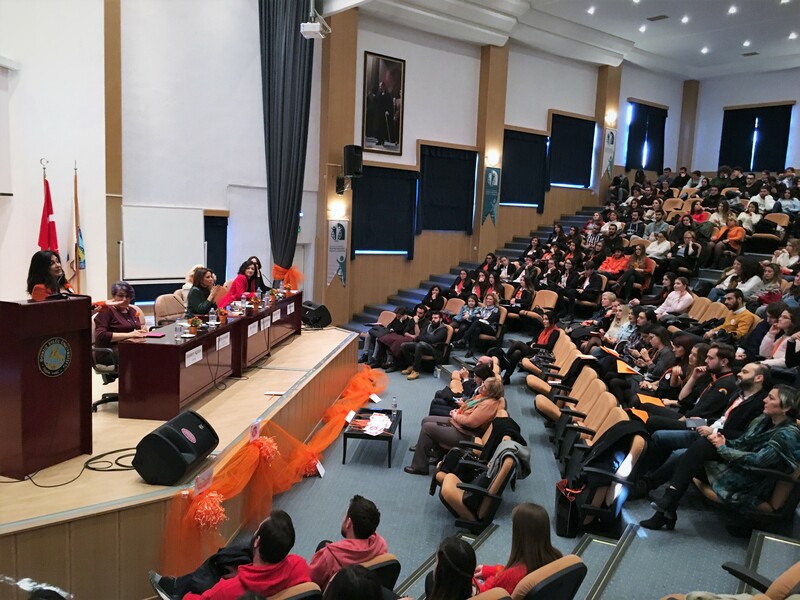 December 7, 2017, İzmir – Dokuz Eylül University Faculty of Business Administration organized awareness activities in the universities and high schools with the university and high school students within the frame of the 16-day activism campaign between November 25 - December 10 in order to end Violence Against Women. 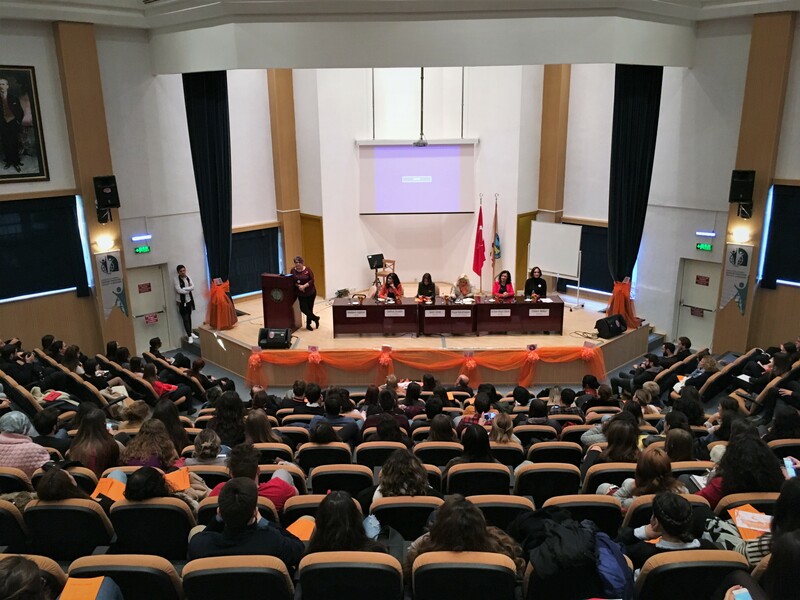 The Orange Summit, held on December 7, 2017, was a meeting where students from Dokuz Eylül, Yaşar, Ege, and Katip Çelebi Universities and Bahçeşehir High School participated. Representatives of United Nations Population Fund (UNFPA), United Nations Office for the Resident Coordinatorship, United Nations High Commission on Refugees (UNHCR), Center for Prevention and Monitoring of Violence (ŞÖNİM) and Dokuz Eylül University Directorate of Women's Rights and Issues Research and Application Center participated in the Orange Summit held in Izmir. The Orange Summit started with presentations of the guest speakers. Gülsen Birgül Özkan from the Center for Prevention and Monitoring of Violence (ŞÖNİM) explained ŞÖNİM and the services provided by ŞÖNİM in her speech. Özkan emphasized in her presentation that everyone who witness violence has a responsibility to reporting it to the authorities by calling 155 or 183. Özkan underlined that it is only possible to bring the violence against women to a close through the development of comprehensive policies. Director of Dokuz Eylül University Women's Rights and Problems Research and Application Center Assoc. Prof. Özlem Belkıs stated in her presentation that Dokuz Eylul University is the only university that has developed a mandatory course on Gender. Assoc. Prof. Belkıs said that only 15 universities among 183 universities have taken steps in the names of gender equality and to counter sexual violence issues in the campuses and have provided permanent solutions. She emphasized that making campuses safer areas is an important part of the gender equality application followed by the universities for the prevention of violence in campuses. At the end of her presentation, Assoc.Prof. Dr. Özlem Belkıs said "Being a real and qualified individual depends on how much understanding of equality that person has". United Nations Population Fund (UNFPA) Gender Equality Program Coordinator Meltem Ağduk mentioned striking figures in her presentation. Ağduk stated "Every day throughout the world almost 50.000 girls are under the risk of getting married before the age of 18 or they are forced to marry. Almost 100 million girls will be the victims of child marriage in the next 10 years. Child marriages are a form of violation of human rights and considered as violence against women because the likelihood of girls experiencing physical, sexual, economic and psychological violence in child marriages is even greater." Emphasizing the end of child marriages and the education of girls, Ağduk continued her presentation: "Ensuring the empowerment of girls and investing in their health, especially in reproductive health, and their education will lead to a significant increase in their lifetime income. Thanks to this investment, healthy, educated and strong girls will postpone the marriage and childbearing to later ages. Thus, their future will be guaranteed, they will work in proper jobs, and their children in the future will be healthier and more educated." Selin Ünal, United Nations High Commission on Refugees (UNHCR), Foreign Affairs and Communication Officer, said in her presentation that displacement has reached a record high in the world in the recent years. Stating that Turkey is hosting the highest number of refugees, Ünal said that any kind of violence is a great risk for this refugee population. Ünal underlined that 75% of the refugees in Turkey consist of women and girls, and explained why they are at risk of exposure to violence. Selin Ünal, at the end of her presentation said "The biggest problem about violence is to remain silent. Fighting against violence is everyone's responsibility, including refugees." The Orange Summit ended with presentations of university and high school students participated in 16-day activism awareness campaigns.